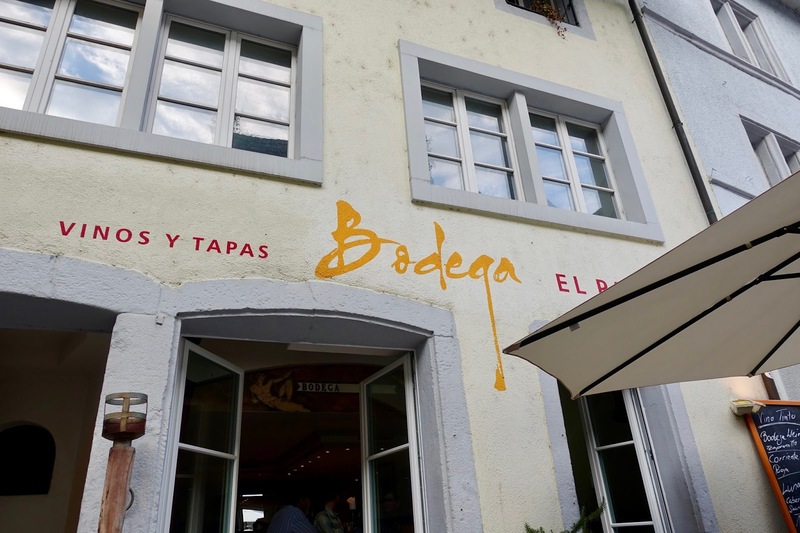 Bodega in the old town of Olten has tapas and a small choice of other Spanish food on offer. Although this eatery is not new in town, my husband and I had not managed to eat there until this year. A befriended couple had been raving about it for years and so the four of us decided to go there on a warm summer evening. Since Bodega was opened – at least twenty years ago, I guess -, it hosted a Spanish restaurant, but not always by the same tenant. The current one has been in charge now for about six years. 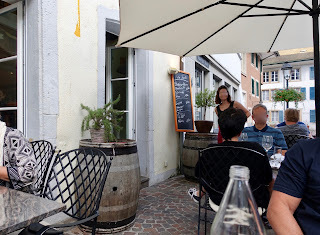 The restaurant is kept in a typical Mediterranean style, a bit rustic, but likable, you feel comfortable there. It is located on several floors, if you have your meal on the second floor, you may hear noise from the first floor where you also find a bar. Therefore, it is recommended having your lunch or dinner on the third floor. 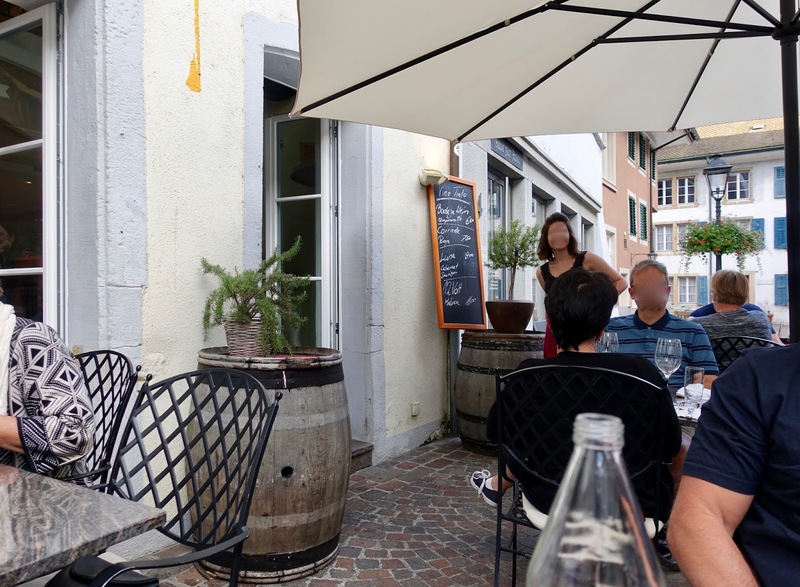 There is also outdoor seating, a few tables in front of the eatery on the cobblestoned streets of the old town. It is nothing fancy, but you can watch the people passing by. When we were there for dinner, we had a seat outside. This was an advantage because of the way meat is served there (more on this later). As already mentioned, tapas are served at this restaurant. There is a wide choice of them, from simple ones such as olives to more elaborate ones like steak tatar. 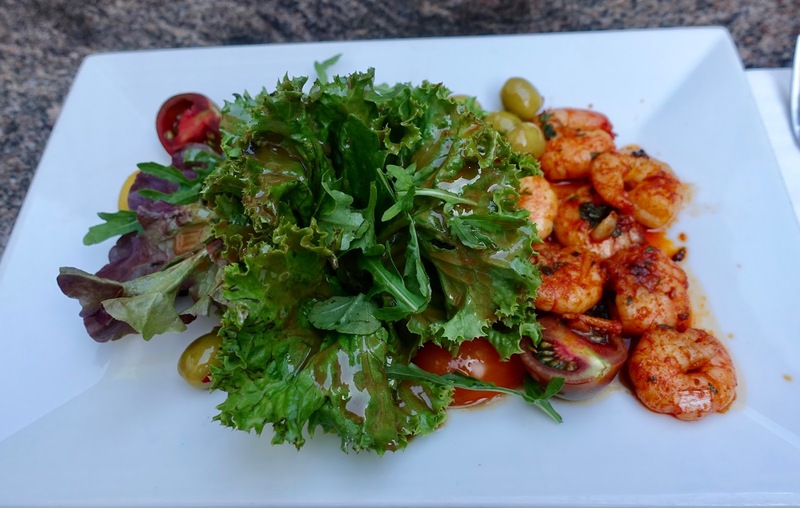 If you look for something beyond tapas, the selection is limited. 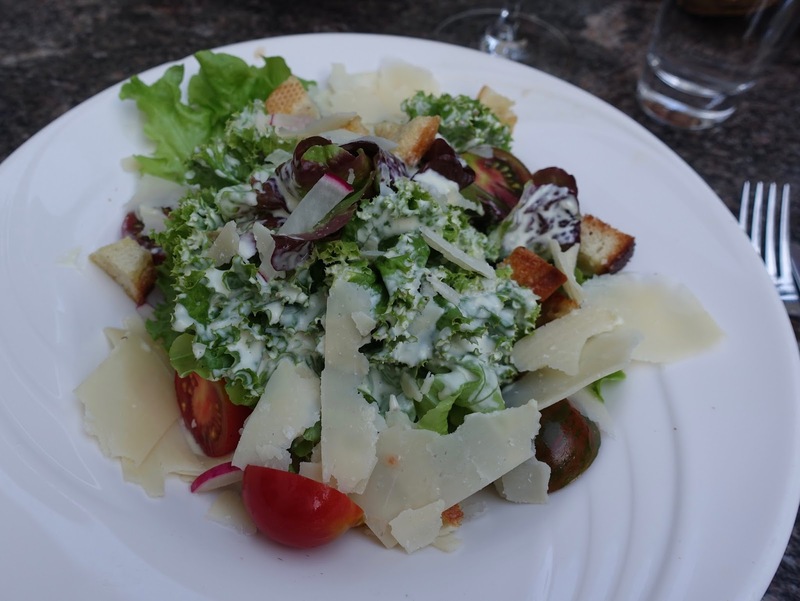 There are a few salads and some pasta dishes available as well as two different pieces of beef (filet and entrecote) on hot stones. Furthermore, paella is on offer, but only when ordered the day before. 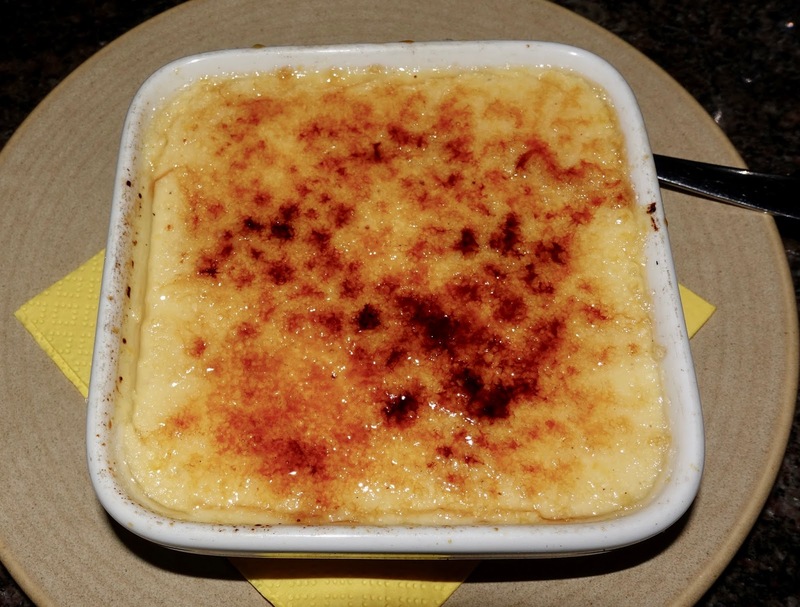 For desserts you can get either crema catalana, chocolate cake or ice cream. We did not come for tapas, but for meat. So we ordered salads for starters, which were simple yet tasty. Then we had beef on hot stones (three times entrecote, once filet). I have to admit that I am not a huge fan of hot stone cooking. The meat continues to cook on the plate and if you have either to eat very fast or slow depending on the degree of cooking. In addition, it is a smelly affair. Thankfully, we had it outdoors so the latter did not occur. 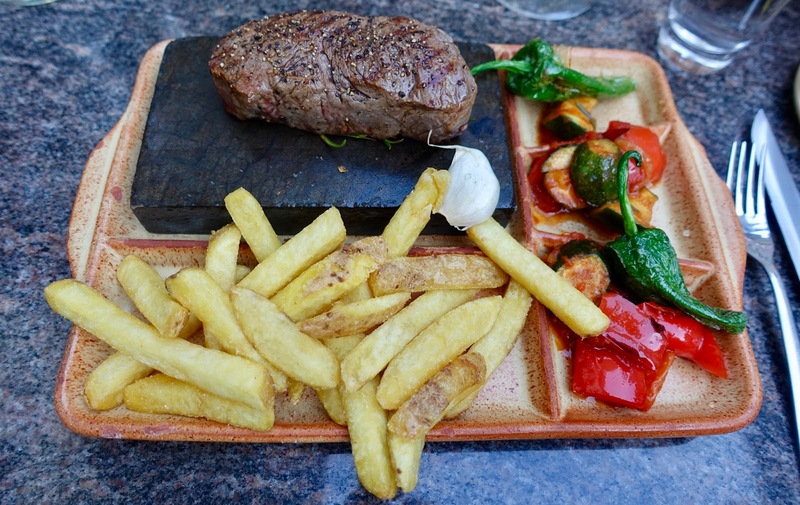 The hot stone dishes are served with vegetables, a variety of dips and either French fries or potato gratin. My entrecote was good, but not outstanding and the side dishes were well prepared. For dessert I had crema catalana, which was nice, but not one of the best I have ever tasted. When it comes to staff, they were efficient and friendly enough, but far from leaving a lasting impression. Prices are fair, you cannot say anything against it. All summed up, Restaurant Bodega is a good choice when you feel like having a salad and a piece of meat. As to tapas I cannot judge them as we did not order them. There is nothing to be really criticized, but also nothing to be praised immensely.